It’s all-electric like a Tesla. It’s priced like a Ford Fiesta. It’s one of the oddest-looking vehicles you’ve ever seen -- and it may just redefine the commuter car. As General Motors Co. prepares to shut the plant near Toronto that got car-making started in Canada more than a century ago, a new model is taking shape in a tiny production facility in Vancouver’s outskirts. Meet the Solo -- a one-seater vehicle made by Electra Meccanica Vehicles Corp. that costs US$15,500. By December, 5,000 will be zipping around the streets of Los Angeles, with an additional 70,000 to be delivered over the next two years across the West Coast. 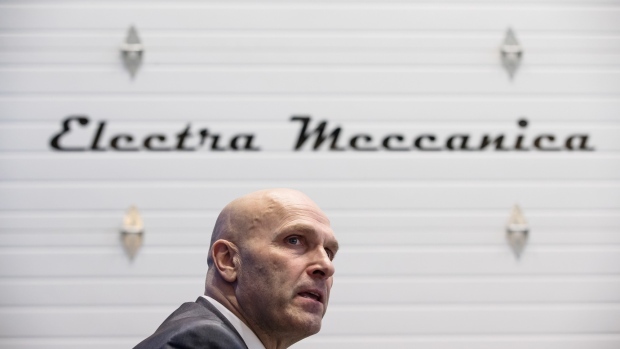 Electra Meccanica may have a market value of just US$140 million, yet it has US$2.4 billion in pre-orders. The stock more than tripled in New York Wednesday. The peculiar three-wheeler may even offer a lifeline to General Motors’ doomed Oshawa, Ontario plant, which is set to close this year and put 3,000 people out of work. “We have had some discussions around that,” said Electra Meccanica Chief Executive Officer Jerry Kroll, adding no decisions have been made. “Nothing would make me happier than to rehire all of those people, with a Canadian designed, engineered vehicle in Canada." Carmakers from Tesla Inc. to Nissan Motor Co. and Volkswagen AG are racing to make the car of the future. So far they’ve produced cleaner, quieter but costlier versions of the ones already out there. Profitability has been elusive -- many manufacturers are likely losing money on each unit, but sell in pursuit of future market share, according to Bloomberg New Energy Finance. Electra Meccanica says its quirky reimagination of an automobile aims to redefine the category. "Tesla is doing a good job on building big cars -- conventional cars that are electric," says Kroll, who earlier worked on electric drive systems for NASA in California and befriended the co-founders of Tesla, Marc Tarpenning and Martin Eberhard. “This company is producing the car that Elon Musk wishes he were building,” Kroll said in a separate interview with Bloomberg Television. “It is great to produce a US$45,000, a US$100,000 car or a US$250,000 car. But for the masses? A US$15,000 car that can get them to stop using gas. That’s creative." 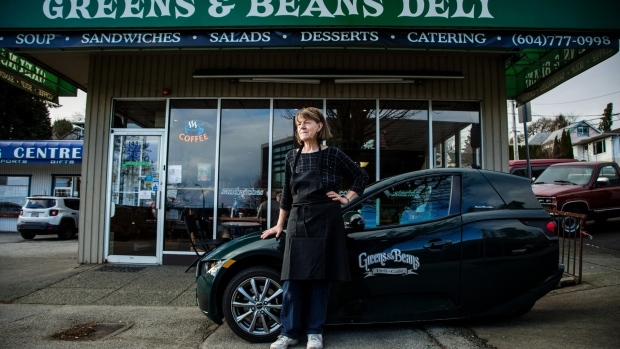 Leona Green, 64, and her son Matthew, 41, were the Solo’s first customers and have been driving it for two years in Vancouver. They park it on the sidewalk in front of the deli they own for catering runs and have ordered a second because they kept fighting over it. “I almost don’t want everybody having one,” she says. At least a few times a day, she passes out cards with the Solo’s specs, kept on hand to avoid answering the same questions repeatedly. So how does it perform? Zero to 60 miles (97 kilometers) per hour in eight seconds, not far off a Porsche Cayenne. It charges in three hours, has a 100-mile range and reaches a top speed of over 82 miles an hour. Remarkably, it can somehow hold the contents of a fully loaded Costco shopping cart in front and back storage nooks." Kroll sees the Solo doing for transport what smartphones did for computing -– something smaller, better and utterly indispensable. “The push back was people thinking they needed a bigger screen,” he said from his Vancouver office. “But today everybody knows you sell a lot more iPhones and make a lot more money on each than you did on iMacs." Those lofty ambitions don’t quite match the company’s share price. Electra Meccanica soared in its first weeks of trading on the OTCQB Venture Market in 2017, at one point hitting a high of US$16 a share, before moving to the Nasdaq last August. It’s tumbled from its record, though soared 220 per cent Wednesday to US$4.33. That reflects some of the skepticism that’s sunk in about the prospects of what looks a bit like a glorified encapsulated tricycle. “It seems like it’s actually a vehicle that you need in addition to your regular vehicle," said Kevin Tynan, senior analyst for autos at Bloomberg Intelligence. “Is it costing you more to have to run two vehicles than to just get one reasonably fuel-efficient one that does everything?" That said, as the costs of electric drive train technology come down, automakers will likely experiment with more diverse vehicle architectures, he said. Some consumers may want minivans, some trucks, and some a commuting tricycle seating one -- but that doesn’t make it the next Tesla. "This idea that we’re on the verge of being the right thing for everybody -- I don’t think we’re quite there yet," Tynan said. 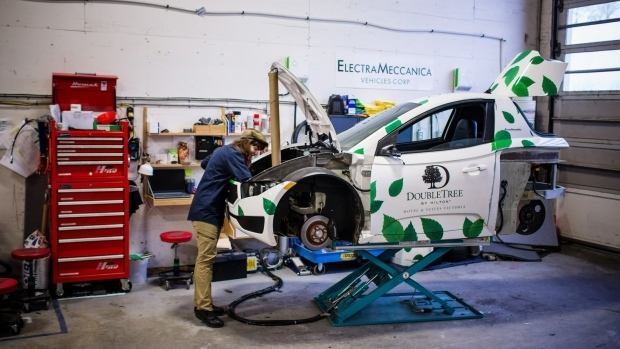 At first glance, Electra Meccanica seems an unlikely contestant in the race toward the mass-adoption of cheap electric cars. Its roots go back to bespoke Italian maker, Intermeccanica, whose gas-guzzling sports cars – like the iconic black convertible Kelly McGillis drives in 1980s blockbuster “Top Gun” -- are pricey collectors’ items. But a 2013 trip to California, which included a stop at Tesla’s Fremont factory, convinced Intermeccanica owner Henry Reisner on both the technology and a wholesale rethink of the modern commuter vehicle, according to Kroll. Electra Meccanica’s targeting three types of buyers -- commuters, car-share companies, and last-mile delivery services like Amazon.com Inc., couriers and pizza shops -- that tend to have one thing in common: one person to a car. Nearly 90 per cent of Americans who drive to and from work every day are alone in the car -- a potentially 115 million-strong market. DHL Worldwide Express and 7-Eleven, Inc. are testing the Solo for deliveries. Hilton Worldwide Holdings Inc. is having guests try them at the DoubleTree in Victoria, British Columbia. Car-share companies are an obvious fit – they could double the number of vehicles available to users overnight by parking 25 Solos in every 10 parking slots. Kroll isn’t fazed by the doubters, nor the lackluster share performance. Electra Meccanica is fully funded and expects to be profitable by year end, he said. “A listing on the Nasdaq was what made Tesla a big company," he says. “If you could imagine being involved with Tesla before they delivered their first 5,000 vehicles, that’s where we’re at right now.